Healthcare@: How Does Your State Rank? While our national debt has reached $17.3 trillion -- 63% higher than when President Obama took office -- do you know the status of your own state's debt? All eyes are often fixed on the national economic outlook but it's important to zoom in on each individual state, where our businesses, jobs, and schools are most closely affected. "California leads the pack with $778 billion in state debt, mostly as a result of the state's $584 billion unfunded public pension liability. 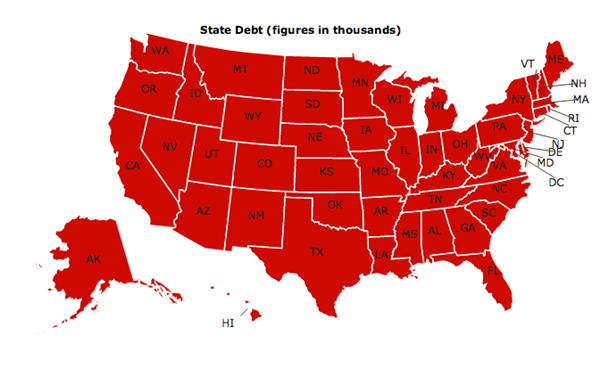 New York ($388 billion), Texas ($341 billion), Illinois ($321 billion), and Ohio ($321 billion) round out the top 5 states with the largest amounts of state debt." "Over time, state debt will exact a toll on state budgets. Money once expected to fund vital services like education and healthcare will have to be redirected to debt service, increased contributions to public pension systems, and more." Now is the time to act. Check out our free resources for activists and candidates to get started today. Read the full report here. You're receiving this email by filling out a form on www.americanmajority.org. To unsubscribe, please see the link below.